The American Cancer Society had a fundraising event at Bentwater Counrty Club on April 7. There were over 100 ladies who participated in a golf tournament to help raise money for the organization. I had the privilege to play for the 45th wedding anniversary of Mr. and Mrs. Robertson, owners of Whispering Pines Golf Club in Trinity, Texas. Because of their love for the bagpipes, the staff at Whispering Pines called Houston Bagpiper to have a piper play for the couple as they had a private dinner on the lake at the golf course. This was a surprise for the couple and they had no idea that I was going to be there for them. A phone call came in to Houston Bagpiper requesting a piper to play at the end of a wedding ceremony and as the guests enter into the reception to have dinner. 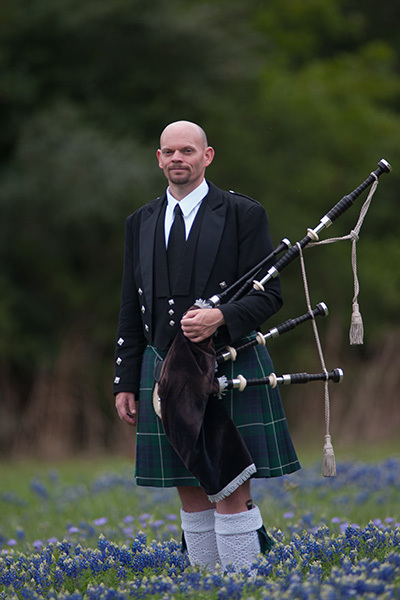 Mr. Shene wanted bagpipes to bring a touch of his Scottish heritage to the wedding. I was hired to play the recessional and for the guests at the conclusion of the wedding.